FiberBasix handheld instruments meet your basic day-to-day test requirements while helping you stay within budget. These worry-free, straightforward solutions enable accurate measurement of signal attenuation during fiber-optic cable installation. 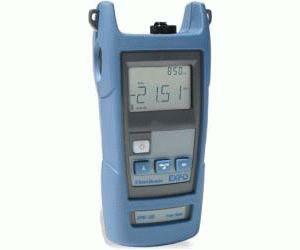 The EPM-100 Power Meter provides highly accurate power measurements, as well as reference value setting capabilities. What’s more, this convenient unit requires no offset nulling, and it offers power autonomy of 300 hours, for reliable, long-lasting performance in the field.